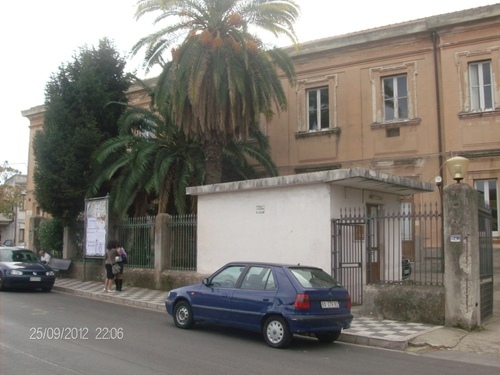 The ancient “Ospedale Civile Principessa di Piemonte”, known as “Civico Ospedale” until the 27th June 1932, is located in Reggio Calabria's province, precisely in the small town of Taurianova (Largo Ospedale). Hospital's story began in 1805, when two buildings suitable for the accommodation of the infirm and an adjacent chapel were built. The buildings dedicated to the hospital were distributed on two levels. The lower floor that was surrounded by a long colonnade that connected the two levels each other. It was used for store, kitchen, laundry, pharmacy and other services. On the upper floor were placed two hospital rooms. They were composed by two large and luminous rooms, where respectively 20 men and 16 women found hospitality. In the same floor were located accommodations for the Sisters of St. Vincent de 'Paul. Since 1881 they have done an admirable and untiring work of health care, as well as spiritual. 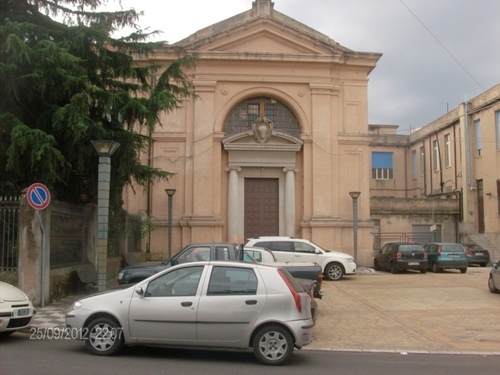 These buildings were used until the 28th December 1908, when the terrible earthquake of Reggio and Messina made them permanently unusable. 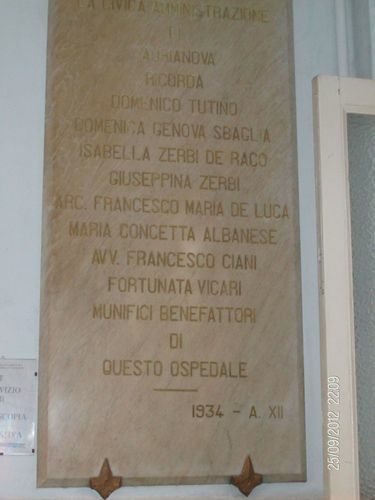 It was rebuilt thanks to the help of several benefactors, remembered by a memorial tablet inside the hospital. 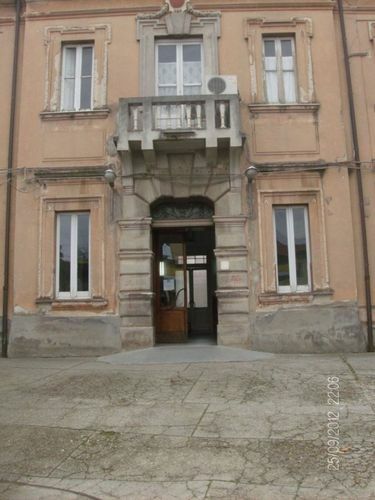 During the 20th century, the hospital became a significant medical center in the province of Reggio Calabria due to numerous doctors who became the pride of the people of Taurianova. 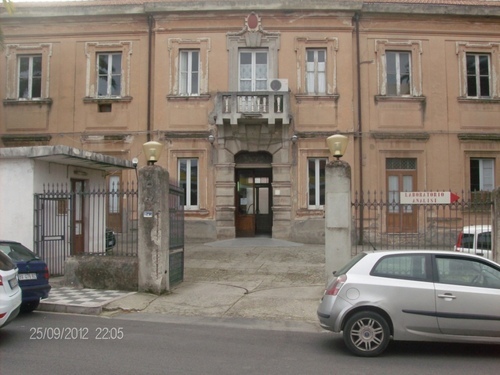 Nowadays the hospital is still in operation, but, because of “bureaucratic” problems, it is no longer what it once was. The hospital was founded as pious work. This is the church adjacent to it. The following memorial tablets are situated in the hospital. 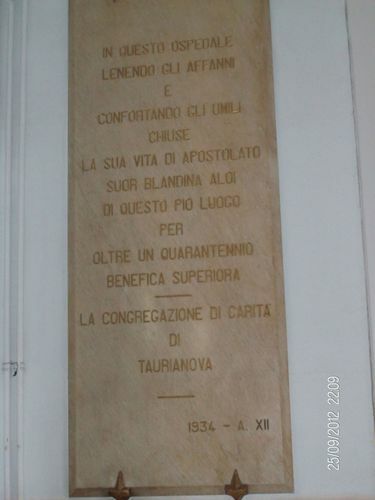 The former tablet is dedicated to the Superior Sister Blandina Aloi, who has been handed down as a courageous, tireless, tenacious and at the same time maternal and charitable woman. While the latter is dedicated to the numerous benefactors of the hospital. - F. M. De Luca, Storia di Iatrinoli. - Isabella Loschiavo, Storia di Taurianova. - Isabella Loschiavo, Personaggi illustri di Taurianova.